Since its inception, the Hubble Space Telescope (HST) has achieved some amazing science, replete with the most captivating astrophotographs ever seen by human eyes. I’ve often perused the numerous image catalogs on the Hubble website with awe and inspiration. 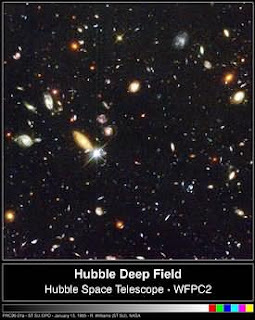 But there is no image so compelling to me than the Hubble Deep Field image. Taken in 1995, the image was the result of Hubble focused on the same tiny patch of the sky for 10 consecutive days. About 1,500 galaxies (not stars, but entire galaxies) are visible in this deep view of the universe. The Deep Field image feeds the imagination and cultivates the mind. I can stare at the magnificent desolation and never get tired. The view represents something almost mystic in quality, depicting the immense nature of the universe, but also signifying how small and insignificant we are as we strive to understand the cosmos with tools like Hubble. The view gives an appreciation of the distances we face in our attempts to detect other locales in the universe similar to our own. The view demonstrates the high probability that life must exist … somewhere … out there … on a planet … circling a star … in one of the multitude of galaxies that can be seen in the Hubble Deep Field. Now that the recent successful repair mission breathed new life into Hubble, we can look forward to ever more penetrating images that will endow us with an increasingly more precise view of our place in the expanding universe.